We are so excited to announce that the latest release of Dive Log, version 2.1, now has an In-App purchase option for Downloading the Shearwater Petrel 2 dive computer. The Petrel 2 includes Bluetooth LE support and so any iOS device that supports Bluetooth LE and can run Dive Log will work. This functionality was announced and demo'd at DEMA last November and we have been Beta testing it since then. Although the core functionality has been working for some time, the last 10% of the details as usual took 90% of the time. For example, what do you do if there are *2* Petrel 2's on the same boat? This dive computer is very popular and so things like this need to be handled correctly and tested. 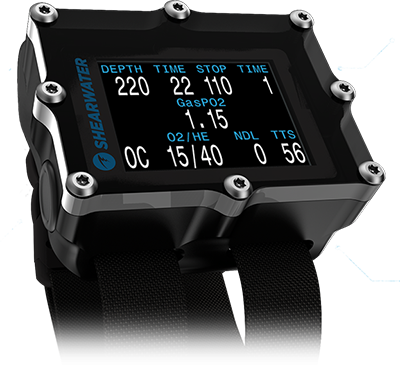 Shearwater has done a press release announcing their new desktop software and the Dive Log support. You can read more about it. Our own desktop software will of course also download the Predator, Petrel, and Petrel 2 via regular Bluetooth and it will also import from the Shearwater Desktop software logbook format. So we're Shearwater ready!